for the Aspirants how are eligibility and experience for the Bank Of Maharashtra SO Jobs, apply online and offline . Candidates who meets the needs of the Bank Of Maharashtra Specialist Officer Recruitment on or before, 07. 10.2017 through the Maharashtra Bank official website . 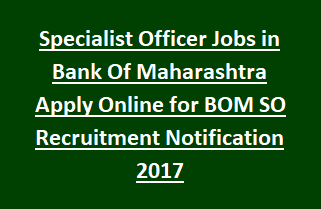 Bank Of Maharashtra SO Vacancy Recruitment Notification was released by the Bank Of Maharashtra For Recruiting 110 Scale II Officers. Candidates who having the education qualification, age limit, relevant experience can apply online and offline by scanning, required documents will be sent by the Post on or before 17.10.2017, so go through the details for more information of BOM SO Recruitment age, qualification. Candidates who are applying for this Bank Of Maharashtra CA Jobs should ensure that eligibility conditions given bellow. Chief Manager Balance Sheet: Graduation form the recognized university with professional qualification on CA in Recognized Institution, 5 years minimum Exp as CM Balance Sheet in Banks , Financial Institutions. Aspirants who are applying for the Maharashtra Bank CA Jobs should have the age limit between 25 to 35 years. Chief Manager Taxation: Bank Of Maharashtra SO applying candidates should have completed their Graduation in Recognized University with the Minimum 5 years exp given by the Bank Of Maharashtra. Chief Manager Taxation age limit between25 -35 year. Charted Accountant: Maharashtra CA Jobs Applying Candidates having CA in recognized institution and having required working exp in Financial Institutions, Banks. For more Education and age limits go through the official notification. Maharashtra CA jobs applying candidates should have age limit 21-35 years for more details of Maharashtra SO Jobs 2017 go through the official notification. Applicants should fallow some of the rules in Application. Maharashtra Bank SO Recruitment in online through the Maharashtra Bank official website, aspirants should send the hard copies application, experience, education mark memos by regards the main branch of Bank Of Maharashtra. For the given jobs in Bank of Maharashtra Candidates can apply through online application till open 16th Sept 2017 to 07th Oct 2017.